In a mythical, ancient Japan, kindhearted Kubo (Art Parkinson) finds himself on the run from gods and monsters, igniting an age-old vendetta. His only chance for survival rests on finding the magical suit of armor once worn by his fallen father, the greatest samurai the world has ever known. With Monkey (Charlize Theron) by his side, as well as his father's former student Beetle (Matthew McConaughey), Kubo confronts his family's past and fights the evil forces that seek to destroy his people. 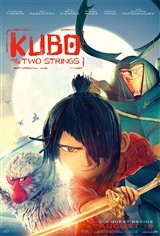 Kubo and the Two Strings was made using a 3D stop-motion hybrid.